This article is about the 1999 Present Chrysler 300M. For the modern Chrysler 300 beginning in 2005, see Chrysler 300. For the letter series of 300 models from the 1950s and 1960s, see Chrysler 300 letter series. For the non-letter series from the 1960s and 1970s, see Chrysler 300 non-letter series. The Chrysler 300M is a full-sized luxury sports sedan that was produced by Chrysler from 1998 to 2004. It is a front-wheel drive, 255 hp (190 kW; 259 PS) V6 engined car using the Chrysler LH platform. It was 10 inches (254 mm) shorter than the Chrysler Concorde to make it exportable to Europe as a sports sedan, and was priced above the Concorde. The 300M was positioned just below the flagship LHS (1999–2001) and Concorde Limited (2002–2004). 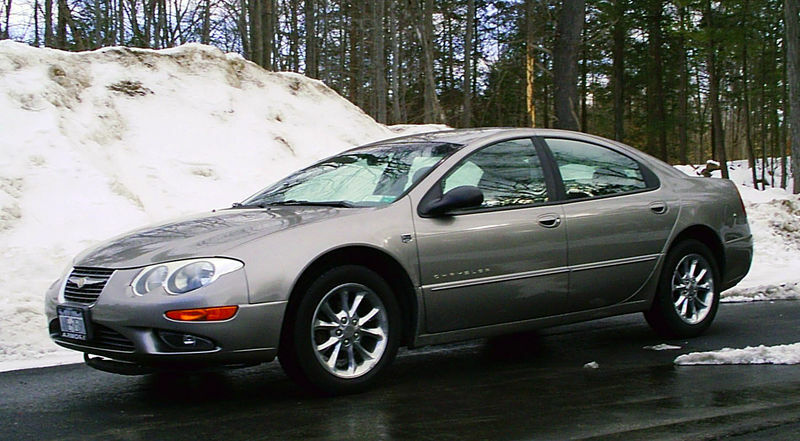 Chrysler redesigned the LH-cars in 1998. The Eagle Vision filled the "import-fighter" segment and its second-generation replacement was benchmarked against the BMW 5-series. However, the entire Eagle line was dropped by Chrysler. The automaker brought back the "300" model name, although the cars were not rear-wheel-drive, nor did they have engines rated at 300 horsepower as did the historic models. It also didn't feature the traditional "cross-hair" grille of previous 300 models, as by the mid-1980s it had been adopted by sister division Dodge for its entire model line. Had the Eagle brand not been dropped, the 300M would instead be sold as a redesigned Vision. Test cars, factory manuals, and design images were prepared for the second-generation Vision featuring a prominent Eagle badge on the grille. The 300M was similar in exterior and almost identical in the interior as the Concorde. The 300M also fit the European "5 metre" (16.4 ft) size class for exports to Europe, unlike the substantially similar, yet larger Chrysler LHS. It had the same wheelbase as the Dodge Intrepid, Eagle Vision, and pre-2002 Chrysler Concorde, reducing its length by cutting front and rear overhangs. Only one engine was available, the Chrysler-engineered 3.5 L V6, initially created for first-generation LH vehicles and revamped for the newer LH line. It was shared with the Plymouth Prowler and a limited edition R/T variant of the second-generation Dodge Intrepid. The engine was shared with the LHS and rebadged Concorde (2002–2004). For 1999, it was rated at 253 hp (189 kW; 257 PS), and 346 Nm (255 lbft) of torque. It was connected to the 42LE, a four-speed automatic transmission with Autostick, which allowed manual selection of gears. Standard gear ratio on the 300M was 3.66:1. The 300M was Motor Trend magazine's Car of the Year for 1999. It also was on Car and Driver magazine's Ten Best list for 1999 and 2000. In 1999, automatic headlamps were added, and the Handling Group removed the speed limiter. In 2000, an interlock was added to prevent shifting the transmission from Park unless the brake pedal was pressed; and tether anchors were added to the rear shelf for child seats. The 2001 model year brought more changes, with an optional luxury group that included an automatic dimming driver-side mirror and supplemental side airbags. A more advanced EVIC (trip computer) was made optional. The 300M also received new jeweled taillights. In 2002, electronic brake distribution was added to the antilock brakes; a new computer combined engine and transmission controls; latch tethers were now built-in; and “natural” evaporative emission monitoring was added. The 300M Special was offered beginning midyear 2002. It featured a 255 hp (190 kW; 259 PS) 3.5 liter engine designed to use premium (91+ octane) gasoline and producing 258 pound force-feet (350 N·m) of torque, with a 3.89 final drive ratio. Performance-type dual exhaust, high-performance brakes, and 18-inch Z-rated tires were standard, with Michelin Pilot Sport 245/45R18 performance tires optional. Other standard features of the Special included premium "Waterfall" leather seats, signal mirrors, body cladding, and slightly lower ride height. This model also included high-intensity discharge headlamps and imitation-carbon-fiber interior trim panels that replaced the standard woodgrain trim panels. A limited number of 300M "Pro-Am" models were marketed during 2002. These versions included an Infinity audio system with subwoofers as well as two-toned leather interiors. In 2003, new colors were added, a six-disc CD changer replaced the four-disc changer, and the changer controls were added to the stereo. 2004 brought optional Sirius Satellite Radio and an optional stereo with DVD-based GPS navigation. For the 2004 model year, Chrysler offered the Platinum Series 300M to coincide with the company's 20th anniversary of Chrysler's original minivan (Dodge Caravan/Chrysler Town & County/Plymouth Voyager). In addition to the 300M, a five other vehicles were offered as Platinum Series: the Sebring Convertible, PT Cruiser, Sebring Sedan, Sebring Coupe, and Town & Country. The Platinum Series 300M was available only in three exterior colors: Graphite Metallic, Bright Silver Metallic, or Brilliant Black Crystal. Other features included: deep slate/light taupe two-tone interior, chrome door handles, deep gloss black turn signal mirrors with a reverse gear auto pivot feature, and 17-inch chrome wheels. A 360-watt Infinity II Cassette/CD player, and a no-charge SIRIUS satellite radio system with a one-year SIRIUS subscription were also included. Additional features include leather seats, satin silver bezels, chrome or platinum clad wheels, and other unique interior features. These models have a special Platinum Series badging on the B pillars. Last updated on 24 August 2016 at 21:50.